Untie yourself from your headset for remarkable voice quality over Skype. 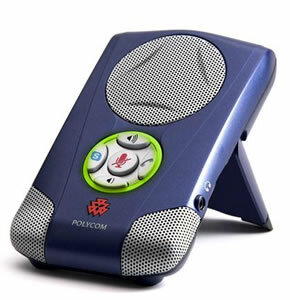 Polycom Communicator gives you the ultimate hands-free Skype experience. Based on the same technology used in Polycom’s legendary line of triangular SoundStation conference phones, the Skype-certified Polycom Communicator enables crystal-clear, natural conversations when using Skype. Enjoy the freedom of not wearing your headset for hands-free Skype calls, or plug into the built-in stereo headphone port for private conversations. The Polycom Communicator delivers high-fidelity wideband voice quality that sounds like you are in the same room with the people you’re calling. Two high-quality microphones provide excellent range for group conversations with up to four participants. Polycom’s Acoustic Clarity Technology eliminates echoes and feedback, maximizing your Skype experience. Polycom Communicator connects and powers through an integrated USB cable for easy installation and use – no extra cables to carry or batteries to charge. Its small size and carrying case make it easy to take with you. Plus, the high-quality speaker doubles as a great portable solution for CD-quality music and presentation audio. Unrivaled ease of use and Skype integration allow you to launch the Skype application and pick up or hang up calls without using your mouse. Convenient buttons and indicators for volume control and mute are also built-in.